I've been a die hard Phish fan for years. After the New Year's show, I had high expectations for the band members' side projects this year. If you have been following Trey Anastasio this winter, you too will know he has been an incredible act and displays the most incredible musicianship and shows his raw talent no matter who he is playing with. The ability to compose masterpieces and perform them with body moving jams. After an incredible winter tour, the Trey Anastasio Band featuring the living legend, Phish frontman, Trey Anastasio along with Ray "the Milkman" Paczkowski on the keys, Natalie "Chainsaw" Cressman on the trombone and vocals, Jennifer Hartswick with the trumpet and a voice with soul like none other, Tony Markellis on the bass, Russ Lawton playing the drums, and last but not least, new-comer James Casey on the saxophone and vocals. I impatiently waited until Thursday, February 13, to wake up to our beloved North Carolina covered in a white wonderland. As my expectations rose, Monday, February 17, I was beyond ready to take the trip to Charlotte, North Carolina to the cozy and well reputable Fillmore to see Trey and the band for the last show of the winter tour. I felt like a kid on Christmas day when the lights turned blue, and one of my personal idols walks onto the stage with his talented group to start the evening off with a groovy and jam filled "Cayman Review" which had earned a reputation during this tour. The crowd was cheering while Trey stops and smiles before starting the next song. He put his hand over his eyes to block the light and see the crowded venue full of his favorite people. The second song of the set, "Money Love and Change" has the crowd singing and dancing. Transistioning into "Pigtails", Trey kept the crowd roaring and dancing while he started playing "Magilla", then onto "Spin". During "Spin", Trey started dancing and moving side to side. Throughout the set, Trey was smiling, laughing, and dancing like I have never seen. He looked so full of joy and you could tell he was enjoying every second of the songs and every note of the jams. Throughout the first set, Trey and the band had some memorable jams, such as "Land of Nod", "Simple Twist Up Dave", "Wherever You Find It". Towards the end of the set, the band played a few slow ballads such as "Gone" and "Frost". Trey finished the first set with "Gotta Jibboo" which was full of intense jams and incredible communication between the band members. During the break between sets, I talked to the crowd around me. The crowd was astonished with Trey, he looked like the was having the time of his life. the communication between each member of the band was phenomenal; each member communicated through their instruments instead of words. The way Trey just looked at Ray or James and would smile while they noodled back and forth. I could not imagine what the second set would look like. The second set started off with a jam which made the crowd roar when "Curlew's Call" started. Immediately everyone around me was back to cheering and dancing as they transitioned into "Night Speaks To A Woman" followed by a personal favorite, "Shine". Even throughout the second set, Trey was dancing and grinning from ear to ear while each member of the band took their turns jamming with a call and response from each other. A Phish favorite made an appearance as "Alaska" was projected through the speakers. The talented and beautiful Natalie Cressman caressed the ears of the crowd with a cover of "1977" originally by Ana Tijoux. The impeccable cover was sung completely in Spanish while Trey took over on his acoustic guitar. The next highlight of the show was something I will never forget. 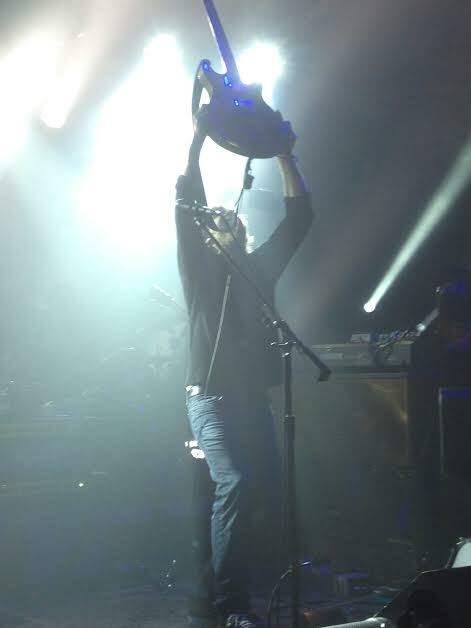 "Architect" was a crowd favorite as the light shined onto Trey's guitar and he projected the beam of light into the faces of the crowd. I personally was beamed from the front row; this created a bond between the crowd and Trey. Shortly after the band trasitioned into the powerful and favorited "Sand". I looked behind m e and the entire venue was dancing and singing which created such a positive vibe. The next song came as a surprise when "Clint Eastwood", which originally was written by the Gorillaz, kept the crowd singing along and groovin'. This song became a transition point where Trey talked about the early years of the band while he introduced each member and told stories of each member. Forgetting Tony Markellis and Russ Lawton on accident, he went on to tell the story of how his next song originated. Hinting at references to the name of the band and the first song Trey, Russ, and Tony wrote, "First Tube" graced its presence which fueled the crowd and created an irresistable urge to dance to the Phish classic. The second set ended with the crowd jumping and full of energy after such an amazing few sets. the "Trey" chant started which resulted in two encores. "Drifting" and "Push On Til the Day" left the crowd with a satisfied evening. The last part was a bittersweet moment. Saying my goodbyes to the friends I had made and checking in on the previously virgin ears of some fans first TAB show which they all were amazed and blown away with the night. The night was compared by some to the most recent New Year's run whe Trey laid his guitar aside and started dancing to Mike Gordon's bass jam. Trey brought the same vibe and looked like he was having the time of his life during each jam and each harmony. I left the Fillmore more than satisfied with the evening and cannot wait until the next time I am priviledged to be apart of the band's history.